Last December, the British government published a summary of the findings of a classified Review of the Brotherhood both in Britain and abroad. The Review was ordered by Prime Minister David Cameron and was conducted by two of Britain's most expert civil servants in the Arab world and Islamist ideology. They concluded that the Brotherhood was secretive, that its claim to have officially disowned violence was not credible and that aspects of its ideology and tactics both in the UK and abroad were "contrary to our values and have been contrary to our national interests and our national security." UK Brotherhood associates identified in the Review have responded angrily, denying they are "in any way linked to the Muslim Brotherhood." British journalist John Ware examines their response in the latest edition of the British magazine Standpoint which describes as its core mission the "celebration of western civilisation." John Ware is a British journalist who was a senior correspondent for the BBC's flagship investigative current affairs programme, Panorama, from 1986 to 2012. He has written extensively about the origins, growth and influence of the Muslim Brotherhood network in the UK which he says closely parallels its American counterpart. The tone was plaintive, almost bewildered. "We work tirelessly for the good of British society on several fronts," Anas Altikriti protested before calling a press conference to refute the government's charge that he and other like-minded Muslim leaders are doing the opposite. A classified government review by two of Britain's leading civil servants, expert in the Arab world and Islamist ideology, has concluded that organisations like the one Altikriti heads are, in effect, fronts for the Muslim Brotherhood — a charge they categorically deny. The Ikhwan al-Muslimeen, as it is known in Arabic, was established in 1928 in Egypt and its goal was — and remains — the step-by-step Islamisation of Muslim communities with the ultimate aim of creating a global Caliphate ruled by holy law. "Allah is our objective" is the Brotherhood's motto, "The Prophet is our leader. The Koran is our constitution. Jihad is our way. Dying in the way of Allah is our highest hope." With Altikriti on the platform was Omer El-Hamdoon, president of the Muslim Association of Britain, and Mohammed Kozbar, chairman of the Finsbury Park Mosque, North London, where the press conference was held. "We are not enemies of the state," said the gently-spoken Hamdoon. All three say they "totally reject the allegation" that they are "in any way linked to the Muslim Brotherhood". Altikriti, in particular, has emphasised that he has "absolutely no links" and on its face his denial would seem to be consistent with the values of "tolerance" and "positive co-existence" which he says he is devoted to promoting. It's certainly a vision a world away from the Brotherhood's founder, Hassan al-Banna, who sought the moral purification of Muslims, because he regarded them as having been infected by Western decadence. That and his belief that Jews were a major source of the infection help explain why he was an admirer of Hitler and why he translated Mein Kampf into Arabic, calling it My Jihad. Al-Banna's legacy has bequeathed a virulent strain of anti-Semitism, homophobia, and disdain for the West and its pluralist values within the Brotherhood that survives to the present day. But no hint of that is to be found in the estimable "Vision" and "Values" section of Altikriti's think-tank, the Cordoba Foundation, which he established so that Muslims and non-Muslims can "strive" to "understand each other." The Cordoba Foundation says it promotes "intercultural dialogue and positive coexistence among civilisations"; it puts a premium on "compassion, peace, justice" and is a "strong voice of tolerance and reason". It asserts that its "independent" research is underpinned by "sound" academic authorities. What could be more in tune with those British values which the Prime Minister has done so much to promote over the last year as part of his counter-extremism strategy? Nothing, according to Mohammed Kozbar, sitting alongside Altikriti. With the help of the Metropolitan Police, the Finsbury Park mosque was "liberated" in 2005 by Kozbar and his fellow trustees from the hook-handed demagogue Abu Hamza, now serving life in an American jail. Today, says Kozbar, the mosque serves as a "role model to other mosques and community centres". In fact, he says, his mosque, together with the Muslim Association of Britain and "similar Muslim organisations", could "teach" David Cameron "a thing or two about British values". Really? It is true the Finsbury Park mosque does good by offering hot meals to the homeless. But since its "liberation" it might also benefit from a few lessons in British values. It has hosted speakers who are on the record as having said they were inspired by the books of Hassan al-Banna and by the Brotherhood's spiritual leader, Sheikh Yusuf Qaradawi, who in 2009 thanked Hitler for having "managed to put Jews in their place". Another speaker hosted by the mosque has described Jews as having "no conscience" and "having all the bad qualities: lies, jealousy, treachery, cowardice, aggression"; another has argued that apostates from Islam must be killed; and yet another has said, "We don't need to go to the Christians, or the Jews, debating with them about the filth which they believe." You only have to imagine what — rightly — would be the reaction had Cameron ever shared a platform with people who spoke of Muslims in such a venomous way. The mosque's trustees are also happy to be photographed with Hamas leaders in Gaza. Indeed, one of the trustees is himself a fugitive Hamas commander. Like some other Muslim Brothers, he appears to use London as a base from which to travel to the Middle East to promote the movement — even though Hamas's military wing has been designated a terrorist organisation here and elsewhere because it has deliberately targeted unarmed civilians. Hamas is, of course, the Palestinian branch of the Brotherhood. The government review of the Muslim Brotherhood was conducted by Sir John Jenkins, until recently ambassador to Saudi Arabia, and Charles Farr, a former MI6 officer and Director General of the Office for Security and Counter-Terrorism in the Home Office. He now chairs the Joint Intelligence Committee. Jenkins examined the development, ideology and structures of the Muslim Brotherhood around the world, from when it was established to the present day. Farr investigated the Brotherhood's network in the UK. The Brotherhood is now banned in Egypt, the Emirates and Saudi Arabia, and in commissioning his review, Cameron has been accused by Altikriti, Kozbar and el-Hamdoon of bowing to those states under threat of losing defence contracts. In truth, the Prime Minister had become increasingly concerned that the Brotherhood's network here, whilst not engaging in violent extremism, was helping to create the conditions that allowed it to flourish. Altikriti and his colleagues say the opposite is true and that Jenkins and Farr's work is "filled with mistakes". Is it? What about their categorical denial that they are not linked "in any way" to the Brotherhood? The published summary of the classified review finds that much about the Brotherhood's UK network of associates and affiliates "remains secretive, including membership, fundraising and educational programmes". Perhaps that is why Jenkins and Farr are careful to refer to "organisations associated (my emphasis) with the Muslim Brotherhood". Judged by this criteria the associations are numerous. The Egyptian Brotherhood has morphed into a global movement of like-minded organisations, often interconnected. Hence Mohammed Kozbar's Finsbury Park Mosque is identified by a Muslim directory as being "Salafai Ikhwan" (Brotherhood) and he is also a vice-president of the Muslim Association of Britain (MAB). 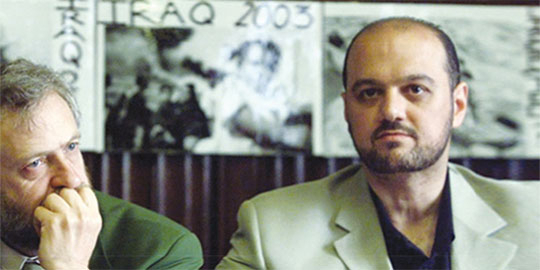 Altikriti was MAB president (2003-04), and he and Mohammed Kozbar were directors (2000-2007). MAB was established in 1997, its founding president having previously been the Brotherhood's official spokesman in the West. In September 2002, MAB published a paper called "Inspire" which explained how MAB had indeed been Brotherhood-inspired. Virtually all of the modern influences quoted were Muslim Brotherhood leaders and ideologues. In 2002, MAB paid its condolences on the death of the "General Guide to Muslim Brotherhood", Mustafa Mashoor, and did so again in 2004 on the death of his successor, Mamun al-Hudaybi. An archived link from MAB's 2004 website identified some of the "links" that Altikriti today insists do not exist. MAB said then that "amongst its members are those who back in their original countries were members of the Muslim Brotherhood." In 2005, Altikriti himself told me: "My family is Muslim Brotherhood." His family are from Iraq and his father, a consultant radiologist, was head of the Muslim Brotherhood there. "When I was in the Arab Emirates, I was extremely closely linked with the Muslim Brotherhood," he explained. "I used to go to some of their (study) circles." At a conference in Doha in 2010, Altikriti was listed as representing the Islamic party in Iraq which he himself has described as a Muslim Brotherhood "offshoot". I count at least 30 Islamic organisations in Britain that are closely associated with the Brotherhood. Broadly, they seek to popularise a more "ideologised" version of Islam (as the theologian Malise Ruthven puts it) by monopolising political representation of Muslims in Britain. They want the government to adopt a more Islamist-friendly foreign policy, and of course to expand politicised sacred space. Even though Brotherhood-associated organisations actually control only a handful of mosques, their political activism has exerted an influence over Muslims disproportionate to their size. Here, for example, is "Jemal", MAB's delegate to a Stop the War Coalition conference, who told the British Communist Party journal Weekly Worker in 2003 that many Muslim organisations here had been "set up under the influence of the ideology of the Muslim Brotherhood . . . we have gone from strength to strength." A decade later, Altikriti was asked in an interview published by his own Cordoba Foundation to identify the "most important Muslim Brotherhood institutions that had an influence on the Muslim community in Britain". Altikriti responded by naming ten organisations, including six mentioned in the government review — another "mistake" by Messrs. Jenkins and Farr: UK Islamic Mission (UKIM); Federation of Student Islamic Societies (FOSIS); Islamic Society of Britain (ISB); Islamic Forum of Europe (IFE); Muslim Association of Britain (MAB); and Muslim Council of Britain (MCB). As the review says, the ISB has been inching away from its Brotherhood birthright and seems to be focused on promoting an identity that's closer to the mainstream. Its activist erstwhile brothers meanwhile claim it is they who represent "normative" Islam. If they are right, we're in trouble. Take UKIM which runs some 50 mosques. Jenkins and Farr say UKIM "still explicitly argues that it is not possible for an observant Muslim to live under a non-Islamic system of government whilst also anticipating the forthcoming 'victory' of Islam over Communism, capitalist democracy and secular materialism". UKIM was established by supporters of the Brotherhood's south-east Asia counterpart, the Pakistani Islamist party, Jamaat-e-Islami, whose members sheltered some notable al-Qaeda terrorists, including the 9/11 architect Khalid Sheikh Mohammed. UKIM insists it has "strongly condemned all forms of extremism" but it is clear, if only in terms of UKIM's worldview, that its definition of "extreme" cannot be reconciled with mainstream Britain's. What about the influence of the Islamic Forum for Europe (IFE)? It dominates the East London Mosque in Tower Hamlets. Like the Finsbury Park Mosque, its volunteers do good community work offering advice on marriages, families, women's services, pro-bono legal support, and ex-offender support, though why such services for Muslims have to be provided by Muslims is unclear if, as the mosque says, promoting community cohesion is its "mission". Under the IFE's influence, the mosque has also transformed large parts of the East End into communities that are so conservative in lifestyle and attire that they have effectively segregated themselves from any meaningful social interaction with the mainstream. IFE members have privately advocated sharia law and it was also the IFE which propelled Britain's first directly-elected Asian mayor, Lutfur Rahman, into power in Tower Hamlets, only for one court to find that he was corrupt, a liar, a politician who played the race and religious card, and an election cheat and now for another court to find he has been a long-standing tax cheat. Yet Altikriti is on record as having said that since its arrival in the UK the Brotherhood has cultivated a "comparatively progressive narrative" here, and is "amongst the most progressive . . . religious- based movements in general". Again, the government review finds otherwise, concluding that MAB — and other Brotherhood associated organisations — have yet to "clearly and publicly promote a vision of Muslims living in this country as integrated British citizens". What is stopping this vision from materialising? The review found the Brotherhood was more focused on trying to Islamise individuals and the Muslim community than the state. Yet that was also Brotherhood founder Hassan al-Banna's strategy as he sought to change Islam, the faith, into a political ideology by Islamising individuals as a first step towards creating Islamised communities with the ultimate political goal of building a caliphate with laws, customs and lifestyles organised entirely around Islam. JW: You have this firm conviction that one day there . . . will be an Islamic state here in Britain? AA: The Prophecy of the Prophet Muhammad is quite clear of that: and that is that the world will embrace Islam . . .
JW: How will this happen? AA: I have no idea. JW: I don't mean this pejoratively but is this something you are working for? AA: No, I would be absolutely lying if I said, "Yes, in my daily activities and when I work for MAB [Muslim Association of Britain] . . . I had in mind that I'm trying to bring forth the conversion of Europe to Islam," I would be lying if I said so. But at the same time I would also lying if I said I'm not convinced in my heart of hearts that it will happen . . . I know for a fact that this will happen in spite of me whether I work for it or not. So if Altikriti is not working towards this global transformation, what exactly is he doing? "The only obligation that I have is what I call Da'wah," he explained, which is the Arabic term for proselytising, or inviting people to Islam. And, according to the scholar often referred to as the Brotherhood's spiritual leader, Sheikh Yusuf Qaradawi, Da'wah is what will lead to Islam coming "back to Europe for the third time, after it was expelled from it twice . . . Conquest through Da'wah that is what we hope for. We will conquer Europe, we will conquer America! Not through sword but through Da'wah." It's a point the Sheikh has made many times. One thing seems clear: whether the Brotherhood is actively seeking to lay the groundwork for a caliphate, the amount of politicised sacred space has expanded rapidly here in Britain as in much of the world since the Egyptian Brotherhood's influence has gone global. It is why this "ideologised" version of Islam is someties referred to as history's latest big idea since the fall of Communism and fascism. So where does the Brotherhood stand on violence? The Egyptian Brotherhood told Sir John Jenkins it had "consistently adhered to peaceful means of opposition, renouncing all forms of violence throughout its existence." Again, he finds otherwise. While engaging politically where possible, Sir John says the Brotherhood has "also selectively used violence and sometimes terror in pursuit of their institutional goals". Brotherhood-linked media platforms "seem to have deliberately incited violence" after the ousting in 2013 by a military coup of the Brotherhood's first Egyptian president Mohamed Morsi because he failed to deliver his commitment to democracy, notwithstanding Altikriti's claim that the Brotherhood is the world's "most important Islamic democratic force". The review also found that the Brotherhood has "deliberately, wittingly and openly incubated and sustained" Hamas, the Brotherhood's Palestinian branch. Altikriti, his two colleagues on the press platform and other Brotherhood-associated organisations have roundly condemned terrorist attacks on the UK and terrorism by al-Qaeda and so called Islamic State abroad. But some of Altikriti's associates here have also openly applauded attacks by Hamas against unarmed Israeli civilians, including suicide bombings. Nor has Altikriti publicly disowned Hamas, which he does not regard as a terrorist organisation anyway, although he has said he does not consider Israeli civilians to be legitimate targets. However, when interviewed by the BBC in 2014, Altikriti denied that the Brotherhood's spiritual leader Sheikh Yusuf Qaradawi supported suicide bombing, insisting he knew of no evidence that Qaradawi did, even though the cleric has been very widely publicised as saying he considers them to be "heroic acts. We should hail those who carry out these acts and bless them and call on God to take them to live in Paradise." Altikriti's claim to have been ignorant of Qaradawi's blessing is especially bewildering because it was his organisation, MAB, in 2004 — the year he was also MAB president — that invited Qaradawi to London amid a storm of protest in the newspapers and on the BBC about this very issue. Moreover, Altikriti was photographed sitting next to Qaradawi at a reception at City Hall, London, hosted by the then mayor, Ken Livingstone. Usama Hasan, now senior researcher at the Quilliam Foundation, says he was present at the reception and heard Qaradawi asked about women and children as targets. According to Hasan, Qaradawi replied in Arabic that there was no such thing as civilian targets in Israel because "Israeli women are not like our women. They are living in a militarised society." Altikriti is fluent in Arabic. What about Altikriti's approach to the Iraq and Afghanistan wars? He is an Iraqi-born British citizen, having been given sanctuary here when he was just two, after his father fled from Ba'athist persecution in Iraq. Some 630 of Altikriti's fellow citizens — British soldiers — have fought and died in Iraq and Afghanistan since 2002. Like many Muslims and non-Muslims he was opposed to both wars. He said he preferred political rather than violent "resistance" because he didn't want to see "any spillage of blood — coalition forces or the Iraqis". Yet he also affirmed the right of Iraqis to use "any means and methods" to expel the "occupation". Those, like him, who were opposed to the invasion had "made a decision to fight for what is true and pure". (That word "pure" again.) Is it really so difficult for Altikriti and the thousands of other Brotherhood followers in this country to understand that it is one thing to see the invasion through the eyes of Iraqis resisting it, but quite another to publicly support them when the lives of your fellow citizens are at stake — especially when those fellow citizens belong to a country that protected your family from Iraqi oppression in the first place? To convince sceptics that the Brotherhood alligned movement here is "working tirelessly for the good of British society on several fronts" Anas Altikriti and Kozbar will need to reconcile their admirable rhetoric — how they strive for positive coexistence, tolerance, peace, compassion and justice, etc — with the words and actions of the organisation they led between 2000 and 2007: the Muslim Association of Britain. While condemning al-Qaeda attacks like 9/11 and 7/7, some of MAB's actions and rhetoric directed at the Israel-Palestine conflict were particularly inflammatory and contributed to keeping young British Muslims angry. On April 13, 2002, MAB organised a pro-Palestinian rally in London. The MAB email advertising this rally was headlined "Muslim Brotherhood launch biggest Palestine rally in the UK", clearly indicating the MAB/Muslim Brotherhood connection that Altikriti has denied. At the rally itself, demonstrators dressed as suicide bombers and carried placards, downloaded from the MAB website, equating Israel with Nazi Germany. In 2003, a MAB spokesman, Azzam Tamimi (whom Altikriti told me was almost certainly a Muslim Brother), wrote an article titled "Anti-Semitism or Just Jews Behaving Badly?" So carried away was Tamimi by his accusations of racism against Israelis, that his own language descended into racism, going well beyond legitimate criticism of Israel and its policies. Israeli Jews were described as "invaders" that came from afar "out of greed . . . justifying their aggression by . . . claiming themselves to be the chosen people of God who are given a divine licence to dehumanise, kill and rob and [sic] entire nation of a decent living". The article concluded: "Few humans may accept the racist claim of other humans of being God's chosen ones who may kill others because they are less divine . . . Until when will the world be able to put up with their arrogance and aggression? If they want to be as human as anybody else, Jews must wake up before it is too late." No doubt Tamimi would say that his hostility to Israelis was not because they are Jews. The same defence was made by the Brotherhood's ex-President of Egypt Mohamed Morsi in 2013 to six American senators who questioned him about a ranting speech in which he urged Egyptians to "nurse our children and our grandchildren on hatred" for Jews and Zionists. In a later interview Morsi described Zionists as "these bloodsuckers who attack the Palestinians, these warmongers, the descendants of apes and pigs". While confining his comments to "Zionists" and never explicitly mentioning Jews, his tirade nonetheless invoked an anti-Semitic theme common in the Middle East about malevolent Jews exercising demonic power: "They have been fanning the flames of civil strife wherever they were throughout their history. They are hostile by nature." Free the sensual desires from their restraints and they destroy the moral foundation on which the pure Creed rests, in order that the Creed should fall into the filth which they spread so widely on the earth. They mutilate the whole of history and falsify it. . . . From such creatures who kill, massacre and defame prophets one can only expect the spilling of human blood and dirty means which would further their machinations and evil. MAB's attempt to mitigate Qutb's diatribe because he wrote it during Israel's 1948 War of Independence with the Arabs doesn't wash. He said Islam's struggle with Jews had raged for 1400 years and described them as "ungrateful" by nature, "narrowly selfish" and "fanatical". Their disposition prevented them from feeling "the larger human connection which binds humanity together". This is just a flavour of Qutb's mendacity. Yet it was under Altikriti's presidency of MAB with Kozbar serving as MAB director that Qutb was lionised on MAB's website as the "doyen" of the Muslim Brotherhood. I don't suggest Qutb reflects either man's views of Jews for I know of no Qutb-like reference by them to Jews. But when a journalist challenged MAB in 2004 about its reverence for Qutb, the best MAB could do was to suggest that his "Zionist ex Mossad friends" had misled him. In the 2013 interview Altikriti granted to his own Cordoba Foundation, he was asked if he thought "the Muslim Brotherhood, since its arrival in the UK . . . had an intellectual effect on the Muslim community in Britain?" He replied: "Undoubtedly so." He is right — but not in the virtuous way he intended. Brotherhood ideology has also been the intellectual inspiration behind those violent Islamist groups that have appealed to thousands of British Muslims. No one more so than Sayyid Qutb. Qutb is now widely recognised as the father of modern jihadism because he decided it was going to take more than just Da'wah (preaching) to establish the kingdom of God on earth. He argued that a revolutionary vanguard should establish an Islamic state and then impose Islamisation, first on Arabs, then the rest. Ring any bells? It's why Islamic State today quotes Sayyid Qutb so heavily in its public discourse. When I listen to the current MAB president Omer El-Hamdoon — who is also an imam — castigating with such passion and conviction the "ignorance" and "arrogance" and "warped mentality" of the "savages" of Islamic State, I wonder if he links it back to the Brotherhood's ideologue whom his organisation so publicly admired just a few years ago. It's a fair question because, beyond MAB's muted qualifier that some scholars disagreed with Qutb "on a number of issues", British-based Brotherhood organisations and associates have not openly or consistently refuted the poison he wrote. But then according to Altikriti, there is no need. "If anything," he says "the Muslim Brotherhood and their ideas has (sic) constantly, constantly, without fail, been the very antithesis of the ideology of the likes of al-Qaeda." Yet Qutb was held up by MAB as a supremely moral being for having "opened his eyes to the malaise of the Western culture and non-Islamic ideologies". He made a "clear distinction between pure faith and association of partners (shirk)" which bluntly means venerating anything other than God. At its most extreme, this obsession with purifying the Islamic faith is what also drives Islamic State to kill everything it deems to be impure and is why the mere mention of purity by Islamists sends a Nuremberg-like shudder down my spine, though not, apparently, the spines of many on the Left nor even some conservatives. The commentator Peter Oborne considers the Brotherhood to be "a great political movement — not just in Egypt". He says he has "seen no evidence of any kind of Muslim Brotherhood terrorism . . . I've looked into it." But then so have two of Britain's most senior and expert civil servants with access to Muslim Brother leaders, British embassies around the world, and intelligence from MI5 and MI6 that presumably Oborne did not have. Given violent jihadism's inheritance from Brotherhood ideology, there is nothing "phobic" about this apprehension. It is rational. Anas Altikriti and his Cordoba Foundation can talk all the grandiloquent talk they like about "believing" in a "world full of hope" where "opposing ideas are working together, enriching our understanding of each other; strengthening our humanity without seeing its end in a grand clash". But until they can reconcile the resounding clash between their enlightened rhetoric and their blind eye to the Brotherhood's regressive ways, sceptics will continue to question whether the change is real or tactical. Clearly Jenkins and Farr have yet to be convinced. Brotherhood literature here, they say, still casts "Western society" as "inherently hostile to Muslim faith and interests and that Muslims must respond by maintaining their distance and autonomy". British society is not inherently "hostile" to Muslims nor ever has been. More than three million Muslims have made their home here and their numbers are growing rapidly. British Muslims are a fact of life. Non-Muslims are crying out for their fellow Muslim citizens to close that distance by articulating a set of values around which a meaningful common life can be built. Until then, the Brotherhood's British network that claims to speak for "normative" Islam will continue, as the review says, to be regarded as operating "contrary to our national interests and our national security." What a debt we all owe to Steve Emerson and the Investigative Project on Terrorism for bringing us such excellent articles as John Ware's piece on the Muslim Brotherhood in the United Kingdom. Here is a clear and cogent explanation of the hypocrisy and contradictions that these con men have used to confuse the media. No hysteria, no hyperbole, just facts speaking for themselves. I once helped host a fundraiser for Steve in Florida. As soon as I am recovered from surgeries, I intend to do so again. Well done to Mr. Ware as well. The UK did a splendid job in laying out the case against the MB as a terrorist front. Now will somebody tell me why the US Justice Department still refuses to list the MB as a terrorist organization? Could it be that Eisenhower's Attorney General gave permanent sanctuary to the Brotherhood's leadership under the 100 Persons A Year Act for intelligence recruits? Yes, I read all the secret files when I was at Justice HQ in Washington. Ike's GOP gave permanent, irrevocable citizenship to Arab terrorists as part of their juvenile plan to recruit the Muslim Brotherhood as a proxy army for our oil companies. Sooner or later, the AG's dirty documents will have to be declassified. We live in an age of documents. There are no more secrets, only deferred disclosures. John Loftus was a Federal Prosecutor at Criminal Division HQ in Washington and spent several years as a GS-13 Supervisory Trial Attorney at the Office of Special Investigations. Loftus' expose of Nazis working for US intelligence won the 1980 Emmy Award for Mike Wallace, and forced a Congressional inquiry. He was the first Irish Catholic President of the Florida Holocaust Museum.